R eef building corals are complex organisms comprising of an animal host and a symbiotic intra-cellular alga (Symbiodinium microadriaticum). Physiological responses of the symbiont to environmental stresses, such as warmer water temperatures, have been directly linked with coral bleaching, however, the underlying biochemical mechanism that leads to the breakdown of symbiosis and ensuing algal expulsion remains poorly understood. H ere we look at the photophysiological and cellular changes that occur in coral algal symbionts under bleaching stress. 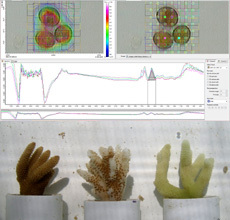 Using synchrotron-based FTIR microspectroscopy, we were able to measure the macromolecular composition of individual algal symbionts, both in symbio (encased within the animal cell) and expelled, that have been isolated from healthy and thermally stressed corals. Top: 2D FTIR spectroscopy map of Symbiodinium cells within host cell of Acropora millepora. Bottom: Thermal bleaching stages of Acropora millepora.